Album number five shows Sophie Ellis-Bextor exploring new musical territory as the singer guides the listener on an epic journey through Eastern European mysticism. There was once a time when Sophie Ellis-Bextor was one of the biggest commercial pop stars in the UK. After featuring on Spiller’s number one summer smash "Groovejet (If this Ain’t Love)", which was named the most played song of the last decade in the UK, Sophie’s debut album Read My Lips reached number two and eventually went double platinum for sales of over 600,000 copies in the UK. The album also produced two further top two singles, "Take Me Home" (a cover of the Cher song) and "Murder on the Dancefloor". The latter was the most played song of 2002 in all of Europe, and a number three with the double A-side "Get Over You/Move this Mountain". This massive success quickly established Sophie as one of the UK’s brightest stars at the turn of the millennium. However, when the London-born singer decided to drop her second album Shoot from the Hip in 2003 the album became an unexpected flop, despite receiving generally positive reviews and producing two top ten singles. Her third and fourth albums also received similar treatment, with 2010’s Make a Scene peaking at a low no. 33 in the UK and failing to get a certification after lead single “Bittersweet” became her first lead single to miss the top ten. Drastic times call for drastic measures. Cue a highly successful stint on British reality TV show Strictly Come Dancing culminating with a top-four finish for Sophie. What’s more, when she left the show she did so having captured the heart of the British nation with her unassuming, elegant nature, which made the public much more accepting when she decided on a change the direction for her music career. A wise move and one that has been paying dividends ever since, with Wanderlust becoming her highest peaking album since her 2001 debut, peaking at number four in the UK album charts. 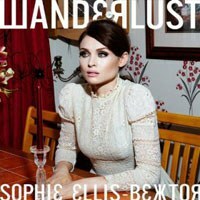 To quote Sophie herself, upon penning the first song for her album Wanderlust "Love is a Camera" she realized that this album would be a very different beast to her previous work. In fact, it couldn’t really be more different unless she decided to turn her hand to death metal. Very few pop stars could pull off such a drastic change in direction and nobody would have predicted Sophie Ellis-Bextor could do it in such style. One listen to the piano-driven lead single "Young Blood" shows that Sophie seems completely at home in her new skin. The love ballad is easily the best on the album and is instantly relatable due to its simplicity, which really allows Sophie to showcase her beautiful voice. The fact is that Sophie sounds more invested in her music than ever and her sincerity shines through on Wanderlust. The album starts off with the Middle-Eastern string laden "Birth of an Empire", which announces Sophie’s new direction in a dramatic fashion. She quickly follows this up with "Until the Stars Collide" and "Runaway Daydreamer" to establish the soaring, dreamy nature of Wanderlust. The two most original tracks on the album are "13 Little Dolls" and "Love is a Camera", which highlight Sophie’s Eastern European influences the most. Both were influenced by the singer’s travels in Russia, where she has managed to carve herself out a respectable singing and modelling career. The former references Russian nesting dolls (Matryoshki) and is driven by a prominent electric balalaika line. The latter is a plodding tango which sees the singer effortlessly spinning a yarn about a girl who takes pictures of people to preserve their memories. Sophie’s music has never sounded so lyrically rich and tracks like this really allow her to show off her storytelling skills. Another highlight is the cinematic ballad "Cry to the Beat of the Band", which again brings Sophie’s unique voice to the forefront and boasts a crashing chorus. Ultimately, Wanderlust is a beautiful thing to behold: a collection of quirky, lovingly crafted songs brought to life by an artist who sounds like she has found herself. The album delves into mysticism and gothic influences that make for a bewitching journey for the listener, but one which is well worth taking again and again in order to be fully appreciated. In the words of Mrs Ellis-Bextor herself the album is "an open love letter to England", which is an intriguing twist to the tale after hearing 11 songs that seemingly celebrate exoticism and globe-trotting. However, upon closer inspection of the lyrics it becomes clear that Sophie’s true love is her homeland and ultimately her journeying has led her back to her front door.